" When an enemy has grasped both wrists, what should we expect these days? " 【My answer】" Such a person isn&apos;t all that unappealing." <Explanation> As Shuto zeme (sword hand attack) of our school is used (see the attached picture), it&apos;s better to say that we abandon any concern for the captured hands as we perform the technique of locking up and disrupting his balance (kuzushi) as a counter attack of sorts, which is a subject of the methodology of our training. Rather than merely learning the techniques of self-defence, in Aiki Budō it is indispensable to develop the intuitive feelings of the body and this is the primary objective. Coincidentally, this hooking defense is practiced repeatedly in the performance of training (tanren), until it is a natural physical response. The center of the body and all four limbs naturally has been transformed to certain adhering quality to them that is quite strong and this causes a kind of transformation in the way the limbs work. All of the techniques and their variations show a definitive inter-connection along these lines, as one progress through them. Because of the importance of these training methods (tanren-ho) , it is also practiced every time from beginners to more experts experienced, it is indispensable to perform it every time in our training method. In Aiki budo world, it&apos;s sad to say that force isn’t useful, to say that making training is not necessary. Saying that both weak women and children are quite easily able to learn the Arts of Self Defence and without any real trouble at doing so, just as many honored masters have said. It is the world of fantasy, so to speak, that will be established only when there is an effort and care of the training lesson. The real battle is not that sweet. So there is conditioning exercise one (tanren 1), Conditioning exercise two (tanren 2) . Tanren three (tanren 3). Even the instructors do these exercises too. That is my basic policy.
" What does 脱力 (datsuryoku) the draining of strength mean? " 【My answer】"It is the key to explosive power"
<Explanation> Having Strength (筋力 Kin ryoku force from muscle) and having money (金) are the same. To the best of one&apos;s ability, one does not waste either instead you save them and keep as much on reserve as you can. Then at critical points when it counts, you use them without any hesitation at all. Yes well, it is like that, isn&apos;t it? It is preparing and preparing for the time of this time to repeatedly practice the training which I mentioned before. And, more than anything to stop the resistance reaction of the enemy, The muscle strength is kept as low as possible as you stop the resistance reaction of the enemy, and neutralize (封じ Fujiru) his power disturbing in same time is balance (崩しkuzushi ) (this is the most difficult), one explodes in a sudden flash and finishes it, that is Jujutsu. From from the beginning and in a flowing way, removing his strength by apply your technique in one breath, this will cause the fact that he will not be able to resist it. Moreover, there seems to be many people understand “draining away his strength as making him total loss of energy", in a state where the whole body is relaxed . All the operation and internal feelings of Tanden are in a state of stillness, it is the same as a mortal state applied in martial arts.
" 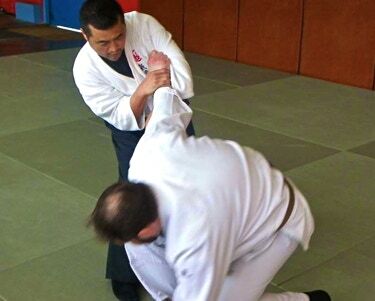 What is 合気 (Aiki) in fact ? " 【My answer】 "Aiki is the opposite of Kiai"
<Explanation> Had there been 100 people that were practitioners of Aiki Budō, then there would have been 100 different ways of interpretation and private opinions in the world of aiki. It seems there isn&apos;t any besides it this uncertain definition in the terminology of the martial arts,. I developed a unique personal theory. The first thing I thought when I heard in my native language the word "aiki" was , and quite frankly I believe it. " it is merely reading the word Kiai backwards..." is something that was said about it. At some ten years of practice , I had the ambition with a rather frank impression about it. "The subject of Aiki is a very simple principle that is far away from the mystical kind".. . If "Kiai" causes a condition of rigidity, "Aiki" is the true reverse so it causes a condition of flexibility (yawara). Again, regarding this principle, moreover, I think that this principle is used not only in a small world of Aikibudo but in a wide variety of places indeed., but actually there are generally many places where one can make practical use of it, and those are my thoughts on it. For example, in such case as the game of baseball, the focused strong arm of the pitcher, the &apos;change up&apos; readjustment of his fingers on the ball, and such as the intensity of collisions in Sumo wrestling and the poses of their slap-downs (hatakikomi). Namely the principles of hardness and softness ( 剛柔の原理 ) of both "Kiai and Aiki". Actually it must be understood that it is utilized in many ways indeed.. In other words, in Aiki Budō there is the "Techniques of harmonization (Aiki Gihō) 『合気技法』" that respond with a consecutive exchange of hardness and softness according to the various situation. In other words aiki giho principle『合気技法』 means "When in confrontation, you must attack the enemy at the moment he is not guarding himself (kyo虚) and make it helpless in a so resistance state. This is the principle and technique of turning circumstances in your favor." And in our school, that is the definition.
" Is it really usable in aggressive fighting combat sports fights? " 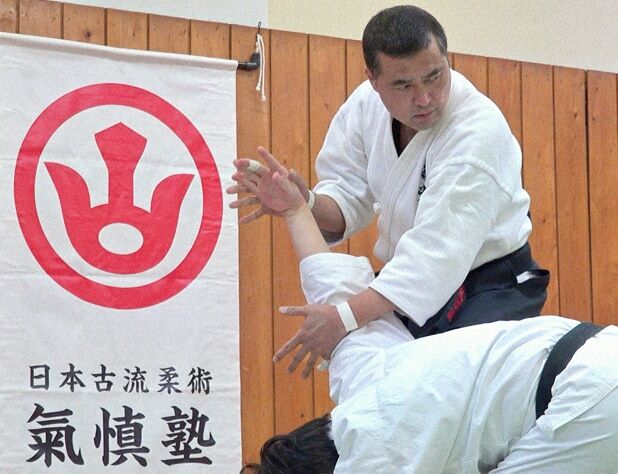 【My answer】"Aiki was intended to be Self-protection. But in combat sports, it isn&apos;t really suitable." In the game of controlling an opponent where sometimes they even compete together in the contest between the different schools, this is "aggressive combat sports" and it is again different from the close combat techniques (kakuto jutsu 格闘術 ) and the idea and the way of thinking from the fundamentals , the concepts of technique, even in that way of thinking, such things were always a source of disagreement. Therefore, in our school, it is the majority of lessons to practice self-defense techniques created assuming various crises in everyday life as a virtual enemy and training. Practice against an actual opponent is then by comparison being limited to practice with imaginary opponents. And the point that the questioner intends is that it is an uneasy factor as to whether the technique can really be used under the real crisis situation even though there is no uses full contact fights whereas the Jiyu kumite fighting patterns and sparring. Really in the actual danger it is a critical point and uneasy factor to know if whether skills can be used under real crisis conditions , I know it all too well myself. I&apos;ve had episode or two with other individuals where I felt quite afraid, I think of it as my own introduction to the facts. Some years back, up to the point of my enrollment I was at my post in a certain security firm, at this hour you&apos;re probably going numb and there&apos;s lots of them who live in the place, if you know what I mean. Really it was quite a valuable experience for me considering what it taught me. And when for the first time the fruits of practicing Aiki jujutsu finally came, even then I never forgot about it. We&apos;d all heard all about the violence of the organized systems of the extreme left, so the company&apos;s employees were all on guard at the place when they came in. During the duties of the work day, about 20 people all members of the gang surrounded one man, after it happened I had a lot of filthy harsh jeering heaped on me, they were getting tired of waiting for an armed encounter with the members of a rival gang, one fellow of which was rather large, he came right up to me and attacked me. It was already too late, his stomach had tensed while he arched his back, the whole time, even though he had been ready for the attack he was making, it was surprising how how naturally my body had responded. Immediately I dropped my center of gravity, hooked the opponent&apos;s chest and in a single jump in the next moment, it was too late for him, my elbow strike hit the opponent in the suigetsu vital point水月 (the pit of the stomach), I got a result with it. It sent this man reeling three metres backwards and have been in trouble for a while. I will refrain from the description of how to do here but It is important when practicing alone to use our kokyūhō breathing method. When the Tanden make and keep fullness constantly (make a state where the center of gravity also drops and the mind and body are stable and calmness). We&apos;re virtually doing this with the purposeful sense of hitting the opponent, this is the case each time we practice, bearing in mind and remembering that the valuable techniques we know are accumulating more and more from the training. So from the experiences of this moment, later I founded the Kishin Juku CHO-FU principle 『張封』 stop aggression with tension , it is also an undeniable fact that this principle became one of the representative techniques of our school.
" How many techniques do you have? " 【My answer】"As I wrote before the total number of our curriculum is 80 but these techniques are basically developed from 30 fundamental techniques." <Explanation> In the contrary , i ask the person who thought "Total number of 80 techniques is quite small ...". For example, supposing that each lesson takes 2 hours, if you acquire all techniques, you can calculate that only one minute and thirty seconds are available for each hand. Could it be said that it was possible to have real high-quality practicing in this way ? I am rather too much with 80 techniques, so even if I would like to reduce them if possible. 30 is the number of technical competency, and since there are some variations, the total number is 80. In our school, we decide the technical task by practice day, in a intensively training way . Therefore good training will end with about 10 variety of 25 techniques each time. 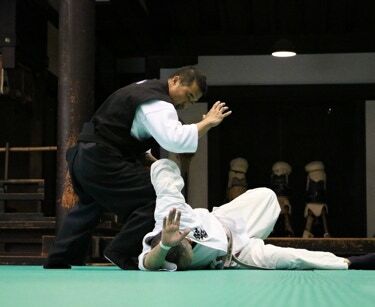 It will be supplemented with 4 hours of special training called "Aiki gihō shūren-kai"『合気技法修練会』once a month, twice a week with 20 variety of 50 techniques. Since this is a time allocation assuming with koden (高伝) acquisition in the end , at our school in this moment beginners and middle-class students are the majority, so it is necessary to repeat all basics techniques and acquire the fundamentals of the aiki technique (Aiki Gi-ho 合気技法 ) and the "Four principles 『四主術理』" , this takes most of practice.
" Do you participate or planning to participate to demonstration performance (Embu-kai) ? " 【My answer】"No I do not plan to participate at demonstration performance for now." <Explanation> At our school there is no idea to host or participate in the demonstration performance at present to present our techniques ., in the old age where there was no high-tech equipment like cameras and videos, I think that the demonstration performance was effective and indispensable as means of handling "kata and techniques" to the future generations. However, as described above, as convenient recording media have become popular in recent years, if it is asked whether or not it is necessary to have demonstration performance excluding the idea of cultural succession, it is my personally opinion that it is unnecessary. Of course, it is natural that there are different views depending on different schools. In addition, supplementing so as not to misunderstand, in order to show perfection of demonstration performances in front of people, there is a reality that we have to spend considerable time and effort in preparation. Once you stop the most important practice for acquiring the aiki techniques as we are always doing at our school, one month before the performance demonstration we will have to concentrate on practicing to raise the quality of the demonstration performance. In other words, it is totally different goal to make training for beautiful appearance for the demonstration performance and to make training for apply the technique of self-defense in the real situation. Even if it seems to be doing the same kind of training at the side, its real that it is quite different, It is imperative to take time in your current training for making training for the demonstration performance. If you do not hold a demonstration performance or if you ask me “why you do not participate in demonstration performance? I will answer "I do not have that time !" Even those who have seriously trained are in need of ten years until the skill works. I would like to obtain as soon as possible high level of skill as possible for my disciples who make time, between their work and their family, for coming to my dojo, so it is the conclusion that I thought so.
" Is there an obligation to acquire Menkyo Kaiden license (license of total transmission) in your school ? " 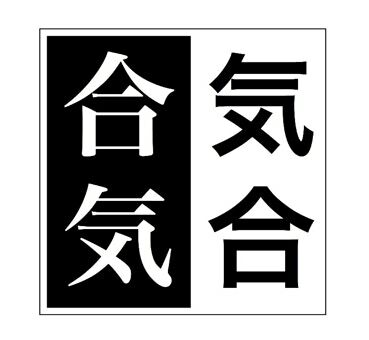 【My answer】" It is not necessary for the general practitioner "
<Explanation> there is an obligation to acquire Menkyo Kaiden licencse only for those who are supervisor of Kishin Juku Shibu Dojo ( Branch dojo) . Therefore it is unnecessary for other general practitioners. If you acquire up to "Koden" (High transmission) who is the level just below “Kaiden” you should have retained enough skills. So in principle, we will refuse all proposals from general practitioners. In addition to more advanced things, unless you don’t have an ascetic practice (Shugyo 修行) which goes beyond the simple teaching at the dojo , even if you went to training in the dojo for decades, you could never reach high level skills. There seems to be some budo schools that sell certificates at expensive high price for all those who wish to start training as easily as possible, only for the sake of money. Such a dojo is called as "McDojo" and it is completely stupid attitude. Both schools that sell Kaiden Shihan certificates (Total transmission certificate) and practitioners that buy it have no merit. 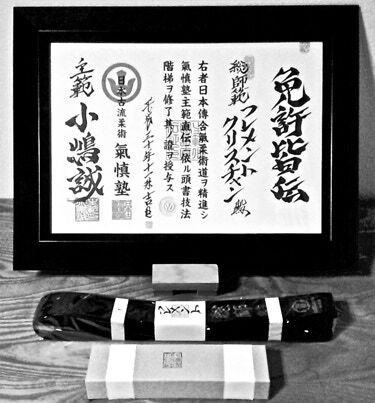 Selling a Menkyo Kaiden certificate is like rice cakes drawn in pictures (means that something is totally useless), the reason for refusing is right there. Note : 絵に描いた餅 Enikaitamochi This Japanese expression comes from the fact that even if you can draw mochi (rice cake) in a picture very well, you can&apos;t eat it, and it is not useful. The essence of martial arts is to train mind and body through training to acquire skills and to have a meaningful life. "Menkyo kaiden certificate" must be given only to those who are teaching and for the students this is certain proof of their instructor‘s competency. People who do not know believe in the title of teacher and its testimonials and it is a criteria of judgment for choosing one among a number of dojos. These certificates should never be issued with absolutely irresponsible reason like money making purpose. Menkyo Kaiden it is a proof that only students with skills and trust of their teacher can hold.
" Can I start Kishinjuku if I belong to other organizations ? " 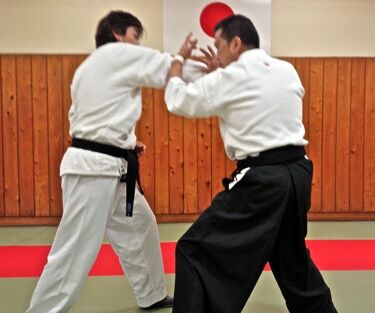 【My answer】" You can participate in the training of Shūren-Kai that special practice with Hombu-dojo&apos;s students. However, you cannot become a disciple of the Kishinjuku Hombu- dojo. " 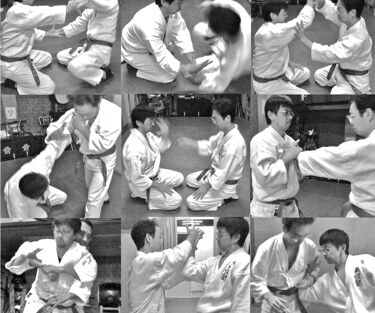 <Explanation> There is a reality that there are a lot of people that how start Aiki-budo practice after experiencing full-contact karate and other combative and competitive systems and martial arts such as Judo and Kendo. There is a lot of people that realize also that it is very difficult to keep these intense practices due to aging, and aftereffects of their past practice and competitions but they people doesn’t’ want to leave the world of martial arts. Frankly speaking, considering the number of times required for mastering Aiki-Giho technique and considering the aspects of work and family occupations. I think it is impossible to master several budo schools practices in same times. As I accept new disciple&apos;s entrance in Kishinjuku hombu-dojo, as I have leader position too, I also have an obligation and responsibility to transmit a certain level of skill and as It is very difficult to learn and teach martial arts practice with two pairs of shoes. Consequently, I will refuse the entrance to Hombu dojo to students that have affiliation with others organizations.